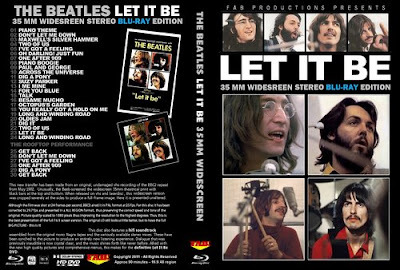 Beatles bootleg specialists "Fab Productions" have released the first ever Blu-ray version of "Let It Be". They are claiming this to be a 1080p transfer from the 35MM print direct to Blu-Ray in 16:9 aspect ratio, augmented by a remasted stereo soundtrack. 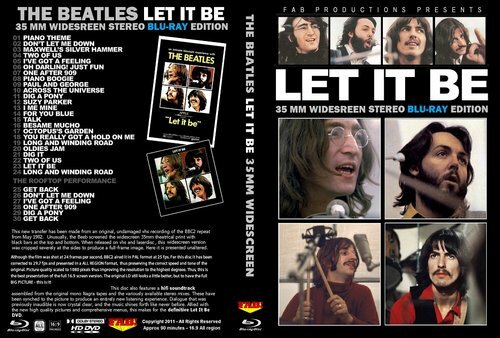 Although this fills a void in any Beatles video collection, everyone is anticipating a definitive, official release of this Beatles movie. It has been suggested that since 2012 will be a big anniversary year for the group (50 years since "Love Me Do"), we may see an official "Let It Be" after all these years. Another Blu-ray title from the Fab Productions company is a 2-disc release from Paul McCartney's recent "On The Run" tour. The film contains every song performed on the tour, taken from 7 of the 8 concert performances. Since many of the people who upload songs from the concerts on YouTube are filming in 1080p resolution with an aspect ratio of 16:9, it certainly makes sense to make the switch from DVD-R to recordable Blu-ray discs for releases like this. Hope this is really what it says it is....an not a print of the earlier widescreen LIB video with questionable sound we saw earlier. So sad and frustrating is the quibbling and control freak obstructionism that has left a real release on the shelf by the remaining players associated with the Beatles. Is there hope for MMT in Blu-ray? I'm also wondering if this is the real deal. Hobs version was great, lets not hope its an up-conversion of the same video source. Blue ray is the thing we need for our video Beatleg collection, I hope every footage is properly re-transferred in the best possible source! Did some checking with relaible sources. It is an upconversion of the Hobs source. Told it was a little better video wise.